The Dead Crewmembers are the victims of an unknown assassin in the Serpent's Wake. They were killed shortly after docking their ship in Anvil. Their ghosts still haunt the ship and prevent Varulae from receiving her cargo, meaning that she needs a hero to do it for her. In life, all four sailors led the same schedule. They all slept on board the ship from midnight to 6am and would spend most of their waking hours on the ship too. In good weather, they would occasionally step out onto the dockside for a three hour walk outside the Harborside Warehouse. Every so often, they would pop into The Flowing Bowl for a two hour meal. The ship's owner, Varulae, who will tell you what she knows: "This is my ship, you see. The Serpent's Wake. I hired the crew to sail to Summerset Isle to retrieve a family heirloom, my mother's crystal ball. They made the journey, and arrived back all right, but then... Someone murdered them! All of them! Now their spirits are haunting the ship!" 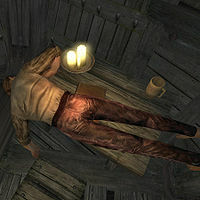 Once you progress enough in the Dark Brotherhood questline, you will find out the mysterious killer from his own diary: "I did it, mother! I killed them all! I killed them and I cursed them to wander their ship in undeath for all eternity! They came to talk to the old man in the lighthouse. When they saw me, they could have kept walking. But no. They laughed! They laughed at me, mother! They called me names! They said I was strange, that I was a human rat, living here in the cellar of the lighthouse. They did not know who they were dealing with! So I snuck on board, later that night, and I slit their throats. Every last one of them. So there the Serpent's Wake sits. The ghost ship of Anvil they'll call it now! Ha ha ha ha ha!" 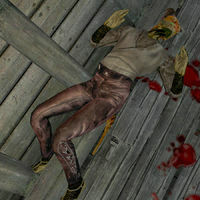 This Dead Crewmember is an Argonian with a small amount of gold, a coarse linen shirt, laced leather pants, and sack cloth sandals. He also has the Serpent's Wake Key. 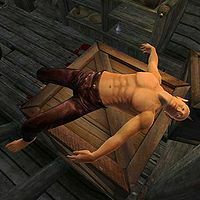 This crewmember is a Bosmer with laced leather pants, a small amount of gold and the Serpent's Wake Key. 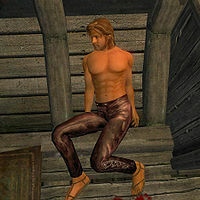 This crewmember is a Breton with laced leather pants, sack cloth sandals and a small amount of gold. He also carries the Serpent's Wake Key. This crewmember is a Breton with laced leather pants, a coarse linen shirt and a small amount of gold. He also carries the Serpent's Wake Key.